In his 1828 Dictionary, Noah Webster said that optimism is the “opinion or doctrine that everything in nature is ordered for the best, or, the order of things in the universe that is adapted to produce the most good.” The pessimist and pessimism are not identified by Noah Webster in his dictionary. I rest my case and encourage you to think optimistically because if you do, I will see you at the top! 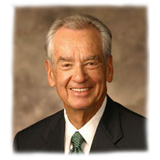 Zig Ziglar is a teacher and motivator. He offers a newsletter filled with more of his inspiring stories as well as practical ideas to help you in the areas of sales, marketing, customer service, and related topics. You can visit him at www.zigziglar.com.